The longest war in our country’s history, the Global War on Terrorism, is still being fought. Tuesday, September 11th is Patriot Day, an annual reminder of why we’re fighting this 17-year war. On this day in 2001, a total of 2,977 innocent people were killed and millions worldwide were rocked by terrorist air attacks on New York City and the Pentagon. Another attempted air attack ended with a hijacked plane crashing near Shanksville, Pennsylvania. Nineteen terrorists died in the attacks. Each September 11th since 2001, we remember and honor the patriots we lost that day and those still fighting the war on terror. At the World Trade Center (WTC) site in Lower Manhattan, 2,753 people were killed as a result of hijacked American Airlines Flight 11 and United Airlines Flight 175 being intentionally crashed into the north and south towers. Of those who died during the initial attacks and the subsequent collapse of the towers, 343 were New York City firefighters, 23 were New York City police officers, and 37 were officers at the Port Authority. Victims ranged in age from two to 85 years. At the Pentagon, 184 people were killed when hijacked American Airlines Flight 77 crashed into the building. Victims were military members and civilians. Near Shanksville, Pennsylvania, 40 passengers and crew members aboard United Airlines Flight 93 died when the plane crashed into a field. It’s believed the hijackers crashed the plane in that location, rather than their target, after passengers and crew attempted to retake control of the flight deck. We also honor the over 3 million brave military men and women who have served since September 11, 2001. Thousands of brave U.S. military veterans have died or been wounded fighting this war. We honor their courage, commitment and patriotism that keeps the rest of us safe. 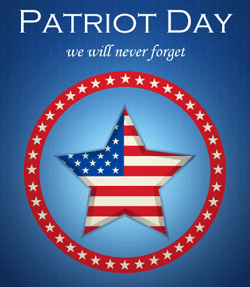 Even though Patriot Day is not a federal holiday, it’s observed throughout our country and abroad. American flags are flown at half-staff and Americans are asked to observe a moment of silence at 8:46 a.m. (Eastern Daylight Time), the time the first terrorist-piloted plane unexpectedly flew into the North Tower of the World Trade Center in New York. As military families know, being prepared for the unexpected includes having adequate military life insurance. USBA is a not-for-profit organization that provides affordable life insurance for military veterans and life insurance for federal employees. Whether you’re active, transitioning or retired, USBA is here to serve you and protect your family.